Good IAQ is associated with greater occupant comfort and satisfaction, and can help employers avoid costs associated with absenteeism, decreased worker productivity, and medical bills from IAQ-related health issues. If a building’s design or construction does not lend itself to good IAQ, building owners may also have to take on additional costs for IAQ investigations and remediation projects. With more and more information available about IAQ issues, building owners, occupants and employers expect designers, engineers and contractors to come up with practical, proactive solutions to combat issues. Temperature: This is one of the most basic requirements for indoor air quality. Temperatures should be maintained at comfortable levels for occupant activities. Extremely low or high temperatures can also be dangerous, and can add to humidity problems. Humidity: This indicates the amount of moisture in the air. It is very important that indoor humidity levels be kept in balance. When humidity is too low, occupants can suffer from dry skin, irritated eyes and sinuses. Excessive humidity levels can result in water condensation, water damage, and mold problems. Ventilation: A good HVAC (heating, ventilation, air conditioning) system should introduce enough fresh, clean air to keep the concentration of indoor air contaminants at comfortable levels. The HVAC system should also keep temperature and humidity levels at agreeable levels for building occupants. Poor ventilation is a major cause of occupant discomfort and is the most common reason occupants complain about IAQ problems. Easier spread of infectious diseases like the flu, colds, pneumonia and Legionnaire’s Disease between occupants. Intensified asthma and allergy problems. Long-term health effects, like cancer, due to toxic substance exposure. Skin, respiratory, circulatory and gastrointestinal system problems. Sick Building Syndrome and Building-Related Illnesses. If occupants notice any unpleasant or musty odors, or if the building feels hot or stuffy, the building may have an IAQ problem. There is an increased likelihood of problems if occupants experience headaches or lethargy that subside once leaving the building because these symptoms hint at a larger overall IAQ problem like Building-Related Illness (BRI) or Sick Building Syndrome (SBS). Information on BRI’s and SBS can be found here. If any of these factors are present, an Air Sampling Test can identify potentially harmful air pollutants. Here’s a quick video on Air Sampling. Designers can help minimize indoor air pollutants by choosing design solutions that contribute to better IAQ. For example, identifying pollutant sources, creating a cradle-to-grave design concept for IAQ, and specifying maintenance and operations requirements can help preserve healthy IAQ. Green building practices are also thought to go hand-in-hand with improved IAQ. Energy conversations features in the design and low-emitting materials are green building practices that support healthy IAQ. Effective and durable building envelopes can help prevent moisture intrusion and keep outdoor pollutants from entering the building in the first place. Materials selection is crucial to IAQ. Many building materials like paints, sealants, caulks and adhesives contain harmful contaminants that can be released into indoor air once installed. Designers can reduce this risk by following ASHRAE standards for low-emitting products in their materials selection. IAQ problems can worsen if a building is used for purposes other than what is was designed for. Reconfiguration of ventilation systems and building operations and maintenance procedures can help building owners regain control of IAQ. 5. New buildings can have IAQ problems, too. Newer buildings have been equipped with more effective building envelopes to help improve energy efficiency and protect against outdoor air pollutants. Unfortunately, HVAC systems are still not always able to provide enough ventilation and filtration to control pollutants in indoor air. This is especially true if the system is overburdened or not a good fit for the building’s purposes or design. Designers, engineers and construction should keep in mind that newer buildings may need extra ventilation and that ventilation systems may need to be reworked if it is being converted for purposes other than those it was originally design for. 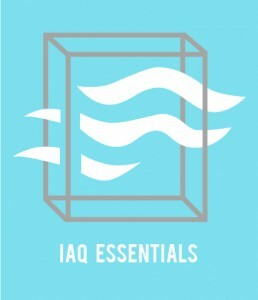 How can AMI Environmental Help Designers with IAQ?